Long before Mur Lafferty became a well-regarded speculative fiction author, she was known for her compassionate, funny and engaging podcast called, ‘I Should Be Writing: A Podcast for Wanna be Fiction Writers’. She has been hosting this podcast for ten years. Mur’s honesty about the ups and downs of the writing process really speaks to me. She’s very encouraging and a master at sharing tips on how to keep one’s self writing (and why it is important to do so). She periodically conducts interviews with leading authors and also an occasional feedback show where people can send in questions that she answers. She has inspired many people and has served as a model for some to start their own podcast about writing, including, ‘The Dead Robots Society’ (of which I am also a fan). ‘I Should Be Writing’ has won the Podcast Peer Award and three Parsec Awards. Mur Lafferty has an MFA in popular fiction from the Stonecoast program at the University of Southern Maine. She has published two novels with Orbit Books. The Shambling Guide to New York City won the 2014 Manly Wade Wellman Award. 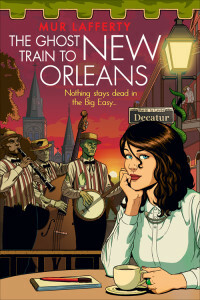 Its sequel, The Ghost Train to New Orleans, came out March 2014. In 2012, she won the distinguished John W. Campbell Award for Best New Writer. She has hosted and/or created shows for Tor.com, Lulu, and Angry Robot Books, as well as created several of her own shows like ‘Geek Fu Action Grip’ and ‘I Should Be Writing’. 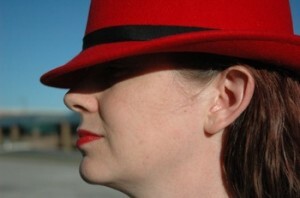 Her nonfiction essays have appeared in Knights of the Dinner Table, The Escapist, and on the podcast ‘The Dragon Page’. The Shambling Guide was a breakout hit. It told the tale of Zoe, a young human woman who finds herself working with monsters, or “coterie” (the preferred term for nonhumans). Yes, they do exist, everyone from zombies to water sprites. They travel and they need to know places to stay (and where to eat) when they do. Enter Zoe, the most unlikely editor of a travel guide for the coterie. Hilarity, a bevy of misunderstandings and juicy subplots ensue. This is urban fantasy at its best. Although I am not doing a review of the book here, let’s just say when I finished TSG, I couldn’t wait to get my hands on Lafferty’s latest novel, Ghost Train. In Ghost Train, we find out more about Zoe’s mysterious background, the different factions of coterie, all while enjoying the sights, sounds and cultural history of New Orleans. I recently caught up with Mur and invited her to talk about her work and the writing life. I’m so delighted to welcome Mur Lafferty to ‘The Practice of Creativity’. Tell us about your new book The Ghost Train to New Orleans. What inspired this book? Ghost Train was born from a story I wrote in 2005 to benefit the Red Cross after Hurricane Katrina. I had an idea about a tour guide who loved her job so much that after she died, she kept doing it. The idea stuck with me, and when I turned it into a book, I took my travel writer, now a human writing guides for monsters, to New York for my first book, but always intended to go back to New Orleans. You’re much admired for conveying humor in your novels. How did that aspect of your writing voice develop and how do you nurture it? I read a lot of Douglas Adams growing up, and was the shy class-clown type. If such a thing exists. My humor tended to veer toward the amusing, and it’s what I enjoy writing the most. As an adult I’ve been inspired by Connie Willis, a writer with sometimes subtle humor, sometimes obvious humor. You helped pioneer podcasting as an engaging and entertaining medium. After ten years of podcasting I Should Be Writing, what do you still love about hosting a podcast? I love that I’m still influencing new writers. At the beginning I felt like I was just whining into a mic about how I couldn’t get published (but was continuing to keep trying) and I’ve heard from so many people that they relate to this. Now my listeners are starting to email me with news about publishing deals, which is amazing. What authors do you consistently mine for inspiration? Connie Willis, Douglas Adams, Neil Gaiman, and Seanan McGuire. What’s next to your bed (or in your Kindle)? What are you reading now? Currently going through the Ancillary series by Ann Leckie, with Kameron Hurley’s Mirror Empire waiting for me. Mur Laffetry is author, blogger and podcast creator. She’s been the editor of Pseudopod, Escape Pod, and is currently the editor of the upcoming ezine from Escape Artists: Mothership (launching August 2015). To find out more about Mur, check out her website The Murverse Annex. –Writing affirmations: I started most writing sessions by writing a kind note to myself. This ritual kept my doubting inner critics relatively quiet. Go here for more on the power of affirmations for writers. –Learned new writing tricks: I stayed on track by writing about 2,000 words every day. I, however, got stuck by the time I got to 40,000 words and headed into Thanksgiving weekend way behind. I was running out of time. Luckily, I found some folks on the NaNoWriMo forums who were setting up timed writing sprints. I’ve done timed prompts before while writing longhand. Doing time writing sprints on my computer were new. I participated in a 2,000 word sprint where you write as fast as you can for 10 minutes trying to make the following word counts in each sprint: 400, 300, 200, 100. You take short breaks along the way and then go in for a second round of sprints using the opposite order: 100, 200, 300, 400. In about two hours you can reach 2,000 words. Several people kept time and we checked in as we reached our word counts. Using this method on Friday and also utilizing the #NaNoWordSprints on Twitter I was able to write about 7,000 words in about six hours. Definitely a personal best. Discovering these writing sprints felt like a miracle. I am grateful to the many writers who organized these events and cheered others on. –Utilized online writing forums: The NaNoWriMo forums were amazing and my go to resource. Encouragement, creativity and humor were in abundant supply. –Periodically reviewed a very popular blog post: on how Rachel Aaron, an author upped her daily output from 2,000 words to 10,000 words. I highly recommend this post. She provides some great tips that anyone can employ. Works wonders. –Used Scrivener-I had heard great things about Scrivener. They are a sponsor of NaNoWriMo this year and I decided to give their special NaNoWriMo template trial offer a go. I literally spent only ten minutes looking at their intro video before diving in. The ease! The joy! It made a huge difference to be able to have all my chapters in one place, and easily visible as icons. I also loved their ‘corkboard’ feature that displays the chapters (or scenes) as movable index cards. This feature was a tremendous help with organization. –Received daily doses of encouragement from Mur Lafferty: I wrote about Mur Laffterty’s excellent podcast a few weeks ago. She like many creative artists are on Patreon. Patreon is a crowdfunding platform that allows direct and ongoing support of artists. I was already in her Patreon circle when she announced that she would be sending a daily short NaNoWriMo audio message to her Patreon supporters. The 3-7 minute commentaries on topics including narrative structure, staying motivated, and character development were fantastic. I came to rely on those daily writing vitamins to keep my spirits up. Check out Mur’s writing and podcast. You might also want to check out Patreon to see if there are creative artists you’d like to support. –Drew on the momentum of daily writing: The success of NaNoWriMo was built on the headwind I generated in the summer writing a minimum of 250 words a day and using the tracking tool of ‘The Magic Spreadsheet’. –I didn’t try to ‘pants’ this one: I spent most of July and August writing an outline and character sketches for this book. This preparatory work saved me. Do I have some plot challenges? Yes. Do I need to add more about the setting, conflict and some of the characters ? Yes. Will I need to do a lot of editing? Yes. But, I am pretty proud of my NaNoWriMo draft. I love my characters and my plot. And, having never written a mystery before I discovered I enjoy writing in this genre. I also like how I just figured things out along the way (without agonizing over details) because of the intensity of writing at high speed. And, I loved being inspired by people who participated in NaNoWriMo and wrote way beyond 50K. In January I will continue work on this project and shoot for a solid first draft in early spring. I’ll also try to keep what worked for me during NaNoWriMo going. If you are still in the writing trenches trying to finish NaNoWriMo, I cheer you on. If you’re not going to finish by tonight, celebrate all the hard work you’ve done thus far. Now, I’m off to order the official NaNoWriMo winner T-shirt and print out my winning certificate! NaNoWriMo update: I’m pleased to say that after the first week of NaNoWriMo, I am on track with a word count of over 15,000 words. And, I haven’t overindulged in caffeine or pulled any all-nighters. I attribute this success mostly to drawing on an outline that I wrote during the summer. As I said in an earlier post, I tend to be a discovery writer (or ‘pantser’). However, for this project I am experimenting with using an outline. I have found Elizabeth George’s Write Away: One Novelist’s Approach to Fiction and The Writing Life extremely helpful on the topic of outlines. She encourages writers to do a step outline (basically a list of scenes), for each section of the book and then write a plot outline. Since I am working on a mystery, where plot is essential, these have been helpful tools. I also have been experimenting with the well-known ‘Snowflake technique’ that helps with structuring a story. This foundation has been a lifesaver, especially since I missed three days of writing. The other thing I do before I begin writing is to compose a nice note or affirmation about my writing. It’s usually something short and sweet: “Michele, you create magic when you write.” I find that taking the time to say something positive helps my mental outlook. For more thoughts on writing affirmations and how to use them, see this post. Also, NaNoWriMo’s organization and communication with us is great. I have enjoyed receiving emails this week from NaNoWriMo that tell me about ‘writing sprints’ organized on Twitter. The NaNoWriMo website is a treasure trove of help, support and encouragement. When inspiration (and willpower) during the month flags, writers can check out the “Pep Talkers” section, where bestselling authors including Brandon Sanderson (“Mistborn”), Jim Butcher (“The Dresden Files”), and Kami Garcia (co-author of the “Beautiful Creatures” series) will provide encouragement. One of the ways I treat myself (and also sometimes procrastinate) is to listen to podcasts about writing. I thought I’d share my favorites with you. I hope these stimulate and inspire your creative work. I’d love to hear about any writing podcasts that you adore, too. What I love about it: Mur is a speculative fiction writer and this is one of the longest running podcasts of its kind. Mur’s honesty about the ups and downs of the writing process really speaks to me. She’s very encouraging and a master at sharing tips on how to keep one’s self writing (and why it is important to do so). She periodically conducts interviews and also an occasional feedback show where people can send in questions that she answers. What I love about it: This podcast makes me feel like I am sitting in the audience, listening to excellent writers talk about craft and read their work. I don’t get to enough readings and this podcast introduces me to many literary poets and novelists that I might not know about otherwise. Angela asks smart and thoughtful questions of each guest. What I love about it: This podcast’s tagline is ‘Fifteen minutes long, because you’re in a hurry and we’re not that smart’. All joking aside, this is an insightful podcast hosted by some of the most well-respected and successful writers and artists working in fantasy, horror and science fiction. They work well as a team and cover a wide range of topics about novel writing. And a bonus is that at the end of every episode, they offer a writing prompt. ‘This podcast is by aspiring writers for aspiring writers. The Dead Robots’ Society was created by Justin Macumber in an effort to offer advice and support to other aspiring writers. It was inspired — in part — by Mur Lafferty’s podcast “I Should Be Writing.” Over the course of the show’s storied life it’s had a bevy of co-hosts. What I love about it: These hosts are funny, bawdy and pretty rowdy. They cover the business of writing (especially about self-publishing and working with indie presses) and also how to stay motivated. ‘The Roundtable Podcast is about nurturing ideas, fostering inspiration, and getting the creative juices flowing. It’s also about mistakes and blind alleys, harsh reality and uncomfortable truths. What I love about it: I’m a new listener to this podcast. I’m captivated by the variety of formats they have: interviews, workshops and themed conversations. They try to create ‘literary alchemy’ with each podcast. I think they do.